Today’s Rainbow Juice <3! Lycopene & Beta-Carotene Jibber Jabber, Is Cooking “Essential”? Here is this juice I made today. 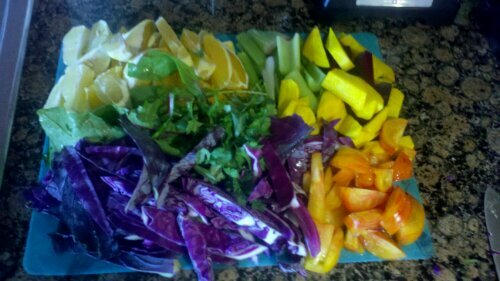 I’ve been calling it Rainbow Juice because that’s the first thought I had while cutting everything to fit in the juicer, hahaha. I am 200% in love with this juice and plan on continuing to make drinks with a similar combination of fruits and vegetables. I received an e-mail from a reader who is concerned with their lycopene and beta-carotene in take. So here is a little information about lycopene, if it is important and is it difficult to get enough on a living vegan diet. The most important determinants of lycopene bioavailability are lycopene concentration relative to water and fat concentration relative to water. Since lycopene is a fat soluble nutrient, it is absorbed better when there is a greater concentration of fat relative to water in a food. THUS THE ACTUAL ACT OF COOKING is not the most important factor in lycopene bioavailability. Cooking just happens to make the lycopene more concentrated because water is lost. Dehydrated tomatoes or sun-dried tomatoes have a greater concentration of lycopene relative to water and a greater concentration of fat relative to water than raw tomatoes (arguably I have read that this is the highest whole food concentration of lycopene). Adding some additional fat to food improves the lycopene to fat ratio for better lycopene absorption. Such as avocado, so never ever feel guilty about enjoying some guacamole or throwing a concoction like this on top of salad. LYCOPENE IS NOT AN ESSENTIAL NUTRIENT, it’s a great antioxidant but not “essential” ❤ Have no fear ;-)The red color is what helps us see which foods are high in lycopene. Other foods are: watermelon, red cabbage, chili powder, guava, persimmons, dried parsley and basil, asparagus and pink & red grapefruit. It has been proven to be helpful with prostate health, yet also people who have recovered from prostate cancer eating a macrobiotic diet (no midnight shades allowed), which does not include tomatoes. Beta-carotene levels actually decrease not increase with cooking. Raw foodists are already consuming so many whole foods high in beta-carotene that they absorb more than those on the Standard American Diet. Cooking actually destroys some of the beta-carotene and other carotenoids like lutein and zeaxanthin (in yellow veggies, aid in vision). Some foods that are high in beta-carotene are: mustard greens, carrots, turnip greens, kale, sweet potatoes, spinach, butternut squash, dried herbs, lettuce (especially red leaf) and collard greens. Look at all of these wonderful options we have out there, an abundance! I personally believe raw foodies or anyone even consuming a high raw diet should have no problem getting enough lycopene or beta-carotene. But of course, please check with your medical practitioner if you have any concerns.